Sagena informatički inženjering d.o.o. participated as a technological partner and lecturer in the first Digital Signage conference in this part of Europe – DiSiCon. The conference was held on 8 May 2012 in Four Points Panorama in Zagreb, where you can still visit the exhibition area of the conference and see digital signage solutions of top producers in the region. Apart from participating as a technological partner with InformAsYouWish solution, Sagena also participated as a lecturer – its Development Manager Andrija Frinčić held a lecture on the synergy of social networks and digital signage and he participated in the final panel discussion. The stress of the panel discussion was on the integration with social networks and creating interactive marketing campaigns. Sagena’s solution, Inform as you wish, makes marketing experts take a step forward and create marketing campaigns that will turn the points of contact between the clients and the brand into fun paly-rooms where clients can communicate with the brand through all available channels. 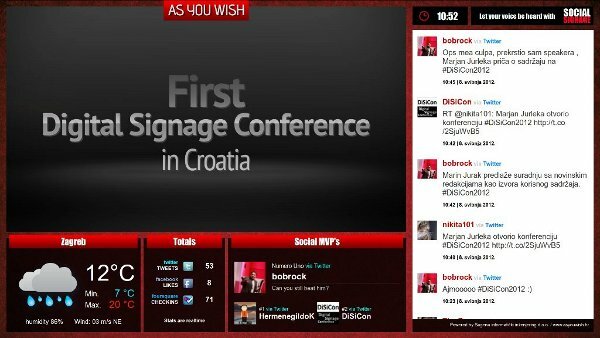 Also, in the exhibition area of the conference, Sagena demonstarted novelties in its InformAsYouWish system, such as, for instance, integration with social networks (Facebook and Twitter) and geolocation social network Forusquare. You can seee the photo gallery here.